Heroin has become quite an epidemic in New Jersey. This is due in large part to its cheap price, easy accessibility and overly prescribed prescription drugs such as Oxycodone/Percocet, Adderall and Vicodin. It’s a common misconception that heroin is only used by young under-privileged teens in drug stricken neighborhoods. Many people including affluent teens and adults grow addicted to prescribed prescription pills. Later, when they can no longer obtain prescription pills legally, they turn to the cheaper alternative: heroin. 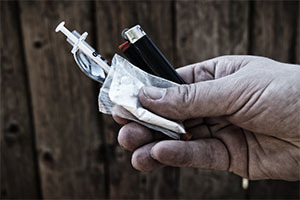 If you have been charged with heroin possession, the most important thing you can do is hire an experienced New Jersey Heroin Possession Defense Attorney. Finding qualified counsel that is right for you is critical. Because of the emerging heroin crisis throughout the state, courts do not take these charges lightly. In fact, quite the opposite. As a result of a conviction, a wide range of penalties may be imposed, including a 3 to 5 year sentence in state prison, community service, a fine of up to $35,000, and a two year loss of license. Depending on the circumstances, quantity and packaging, you may be charged with possession with the intent to distribute, in which the penalties greatly increase. In pertinent part, N.J.S.A. 2C:35-10 makes it unlawful for any person, knowingly or purposely, to obtain, or to possess, actually or constructively, heroin. In order to be convicted the prosecutor must prove that the defendant knowingly or purposely possessed heroin. The element of possession can be satisfied in one of two ways, by constructive or actual possession. Constructive possession exists where drugs are found in the vicinity of an individual, in a place where he or she can readily access the drugs. Actual possession means the drugs were found on the person’s body. Constructive possession cases are typically more difficult for the state to prove because the heroin was not actually located in the person’s physical possession. At LS&P Lawyers we have a reputation for casting doubt on the prosecutor’s ability to prove, beyond a reasonable doubt, that someone was in possession of heroin when it was not in fact found on their body. For example, maybe you were arrested in a park with a group of people. This can make it difficult for the prosecutor to prove whether or not the heroin actually belonged to you. The consequences stemming from a heroin conviction are weighty, including a permanent criminal record that can only be salvaged through Expungement. This is why it is so important to have an experience attorney represent your interests in court. At LS&P Lawyers, we may be able to minimize the consequences. If this is your first offense, it is likely that you will be eligible for a diversionary program such as Pre-Trial Intervention (PTI) or Drug Court. Our criminal defense attorneys are able to provide the aggressive advocacy needed to make this happen. We provide serious representation for serious matters. Contact our office immediately to begin your defense.